The Murray Bridge region will become a hype of activity next week for the opening round of the 2018 SP Tools Australian Kart Championship, presented by Castrol EDGE. 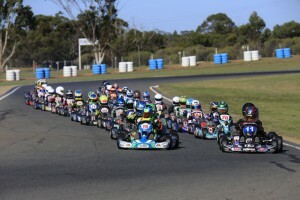 With a record 291 entries having been received across the nine Championship Classes, the event will be the largest ever held at the Monarto Karting Complex since it opened almost a decade ago. In addition to every State and Territory in Australia, Competitors will travel from as far as New Zealand, Singapore, the Philippines, Taiwan and America to compete at the event. Greenwith teenager Blake Purdie, who makes the step into the elite Junior Class (KA2) this year, is hoping that some home-track knowledge will help him kick-start his 2018 campaign off in a winning fashion. “After racing in the KA4 Junior Class last year KA2 is a huge step up for me but it’s a challenge that I’m really looking forward to,” said Purdie. “It’s the most powerful class in Australia that a driver of my age can race but the higher speeds don’t faze me, it actually makes me more excited than anything else. Purdie is one of three South Australian drivers competing in the KA2 Class where the youngsters will exceed 110 km/h. He will be joined on the grid by third-generation racer Amber Miller from Largs Bay and Mount Gambier’s Kai Allen. The youngest drivers, aged between 7 and 9 years old in the Cadet 9 Class will reach speeds close to 80 km/h around the 1020-metre circuit. For these children the thrill of success is matched by the lessons in car control and driving techniques well before they are old enough to obtain their road licence. 33 drivers will be on the grid in the elite KZ2 Gearbox Class that features Dunlop Super2 Series Driver Macauley Jones and SuperUtes Competitor Aaron Cameron, both of which will be in action the following weekend at the Adelaide 500. Official practice begins on Friday February 23 ahead of qualifying and the opening races on Saturday February 24. The finals will be contested on Sunday February 25. 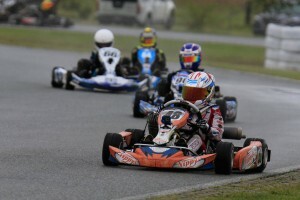 The Monarto Karting Complex is located on the Old Princess Highway, Monarto. Admission is free for spectators.